About: In this third volume of his studies into critical Internet culture, following the influential Dark Fiber and My First Recession, Lovink develops a ‘general theory of blogging.’ Unlike most critiques of blogging, Lovink is not focusing here on the dynamics between bloggers and the mainstream news media, but rather unpacking the ways that blogs exhibit a ‘nihilist impulse’ to empty out established meaning structures. Blogs, Lovink argues, are bringing about the decay of traditional broadcast media, and they are driven by an in-crowd dynamic in which social ranking is a primary concern. The lowest rung of the new Internet hierarchy are those blogs and sites that receive no user feedback or ‘zero comments’. Lovink explores other important changes to Internet culture as well, including the silent globalization of the Net in which the West is no longer the main influence behind new media culture, as countries like India, China and Brazil expand their influence. Zero Comments also looks forward to speculate on the Net impact of organised networks, free cooperation and distributed aesthetics. Geert Lovink travels far and wide in earth space and media space and always brings back a good story and telling criticism about what is moving and shaking in the digital realms. He is our Virgil, guiding us through the heaven and hell of ‘new media’ –not to mention the purgatory. Highly recommended. I often disagree with Geert Lovink, but always pay attention to him. His writing, activism, organizing, and teaching since the emergence of the Internet as a cultural phenomenon, has contributed powerfully to a sorely needed critical discussion of how digital media, new media industries, business fads relate to existing social, political, economic contexts. Geert Lovink cuts through the cliches, cynicism, and hype, and looks at Internet culture in all its messy, contradictory reality. Nobody has thought longer and harder about the state of the Net today, and where it might be heading. 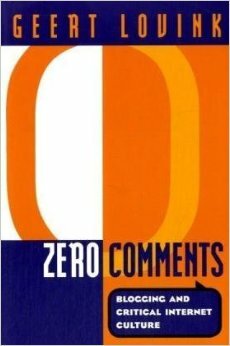 Zero Comments is both richly detailed and engaged, and breathtaking in the sweep of its edgy, contrarian, and urgent vision. Steven Shaviro, author of Connected. Lovink’s knowledge of the technology and his critical intelligence combine to produce an exceptionally sharp presentation of current challenges and possible futures. He works at the edge of established understandings, detecting what mostly has remained undetected, no matter how huge the literature on this subject. Saskia Sassen, author of Territory, Authority, Rights: From Medieval to Global Assemblages. Geert Lovink, Zero Comments: Blogging and Critical Internet Culture, New York: Routledge, 2007. ISBN: 978-04-1597-315-1. The German translation is published by Transkript Verlag, Bielefeld, Germany. ISBN: 978-3-89942-804-9.